You're playing in a multiple deck game with standard rules. You are dealt a six and a seven for a two-card 13 which you'll play against the dealer's upcard of two. There are not too many options to consider here; what it comes down to is that you're faced with a hitting/standing decision. What do you do? Well, it's really quite simple - you're going to stand on this two-card 13. 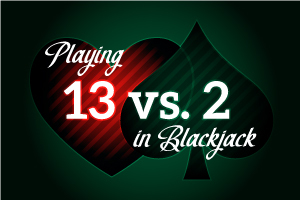 What you have to guard against here is something even certain people familiar with proper Basic Strategy tend to do from time to time, which is to confuse this with the situation where you have a 12 and the dealer has a 3, in which case you hit. The presence of a two as the dealer's upcard presents a difficult situation for the player. That's because, in general terms, the dealer has to draw a couple of ten-value cards in a row to bust. And the percentages are against it. You have to weigh that against the chances of improving your hand enough to beat the dealer with 13 as your starting point. The bottom line here is that the player who hits the 13 will win on approximately 32% of his hands while losing 63%. The player who stands with the 13 will also suffer a negative expectation, but it will be slightly less, winning over 35% of the time while losing about 65%. It is indeed a close call here, but the decision to stand has to rate the slight edge. Therefore, that is what we do.